Intent-based networking is Cisco’s big push for the future of network management. 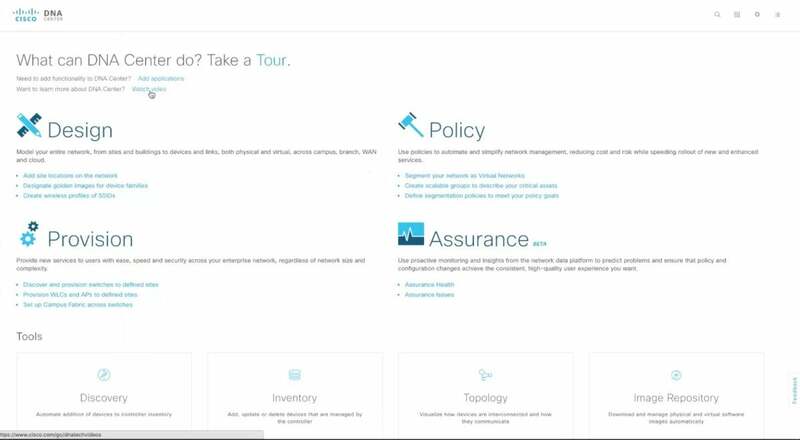 Here’s a preview of DNA Center – Cisco’s IBN software. Cisco’s DNA Center is a new network automation software that the company has positioned as the interface for its ambitious intent-based networking (IBN) strategy. This is where network administrators manage all of the settings that are applied to new devices onboarded into the network. Users are able to define sites in DNA Center – for example, a headquarters or branch, or a specific geo location. In the design portal, users define how equipment should be configured, depending on its domain. Funcgtions such as establishing a host protocol, setting the domain name, establishing syslog files and configuring management protocols are all defined here. Then, when a device is deployed at a site, DNA Center automatically grabs the configuration settings for that site and installs them on the device. “I can define a hierarchy of settings once and everything underneath that domain will inherit those settings,” Solder explains.